The following article was written by Sophy Yildirim & Rachel Hammerton of Southsea Slings Ltd and is reproduced here with their permission. Whether you're expecting your first bundle of joy or chasing a team of toddlers, choosing to use a sling can be a child care revelation. With carrier's sales continuing to rise, 'babywearing' shows no signs of disappearing, and it's never too late to learn how. So why are so many parents so keen to get up close and personal with their little ones? Aside from the clear advantage of convenience, when a baby, or two, join the family, having both hands free becomes a luxury! The list of benefits to both parent and child is endless, from aiding recovery of post-natal depression to reducing the risks of plagiocephaly. Carrying your newborn safely and comfortably (see TICKS Safety Rules) makes it possible to recognise and respond to their needs quickly, meaning fewer tears and less time spent trying to soothe and satisfy. Using slings is a handy skill for breastfeeding mothers and the perfect way to get all the skin-to-skin time baby needs. It's also a particularly beautiful way for dads to bond. Carrying also proves successful time and again in helping babies with colic, reflux and wind. Having baby in a well supported, upright position with the gentle movement means gravity can work its magic, sending milk and stomach acids down and trapped air up. Key developments of a baby's spine and pelvis take place in the early years, during which time the optimal position, for baby, is with a curved back, knees above hips and legs apart: a straddled squatting position. To find a carrier which best supports baby's development and your body shape, it's a good idea try various styles. 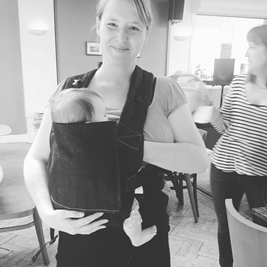 The majority of high street slings have a narrow seat and narrow shoulder straps, meaning a poor spinal/hip position for baby, and poor back support for you! Online it is easy to browse through beautifully designed and expertly made slings; ring slings, stretchy wraps, woven wraps, mei tais and soft structured carriers to name the most popular. It can be quite overwhelming! To help you through the jargon and on to cuddles on the go, there's plenty help out there. These are exciting times for sling users and there is a wealth of information and advice right on your door step, literally! All over the country there are weekly and monthly groups and extensive libraries, giving opportunities for parents and carers to swap tips and get expert advice. In Portsmouth, 'Southsea Slings Ltd', www.southseaslings.co.uk a fully qualified, insured and experienced team of babywearing consultants, hold a monthly library service giving you the chance to try before you buy from a varied range of different carriers, as well as regular workshops to make sure you get it right every time. Prefer one to one? Not a problem with private consultations, or perhaps a bespoke event just for you and your friends. There are lists of babywearing consultants, libraries and groups available on www.babywearing.co.uk www.ukslinglibraries.co.uk, and www.slingguide.co.uk, all highly recommended and trusted sites. Whether you're an absolute beginner or just perfecting a new technique, using a sling safely and comfortably can be learnt quickly, will be long lived and will never be forgotten. Safe baby wearing, download or print out this TICKS document. Feeding with a sling, download or print out this document.